A Russian cargo retrievable spacecraft is expected to be developed for the needs of a new orbital station in 2022, Energia Rocket and Space Corporation, the spacecraft’s developer, said on Friday. 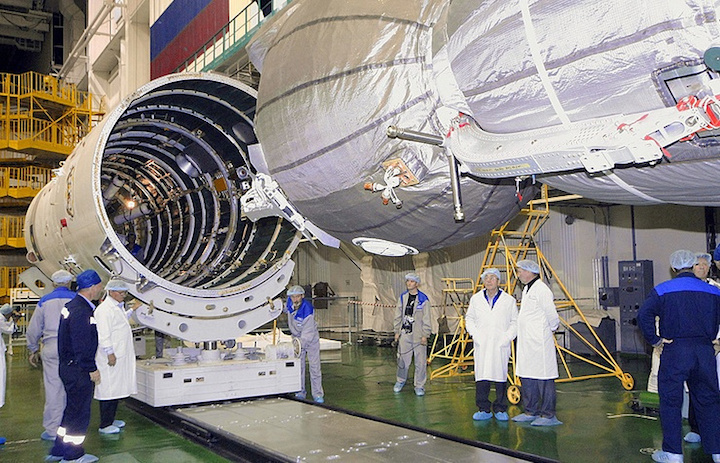 "The development of the Soyuz GVK [cargo retrievable spacecraft] is planned to be completed in 2022. A Soyuz-2.1b carrier rocket with a large lifting capacity is planned to be used for the spacecraft’s launch," the Energia press office said. A cargo retrievable spacecraft will be able to deliver two tonnes of cargoes into orbit and return 500 kg to the Earth and the spacecraft’s detachable compartment will have a capacity to house about another tonne of disposable cargo, which will burn in the dense layers of the atmosphere, the Energia Rocket and Space Corporation said. Energia First Deputy CEO, Chief Designer for Manned Space Systems Yevgeny Mikrin said that the company planned to develop a new cargo retrievable spaceship for resupplying a new orbital station that may appear after the operation of the ISS comes to a close. He also announced plans to create a new orbiter that will consist of five modules with a total weight of 60 tonnes. Today only US Dragon space vehicles can return cargoes from orbit. Russian Progress spacecraft deliver cargoes to the ISS but later bury them in remote areas of the Pacific Ocean after their service life expires.